Preheat a non-stick frying pan or a sandwich toaster to medium. 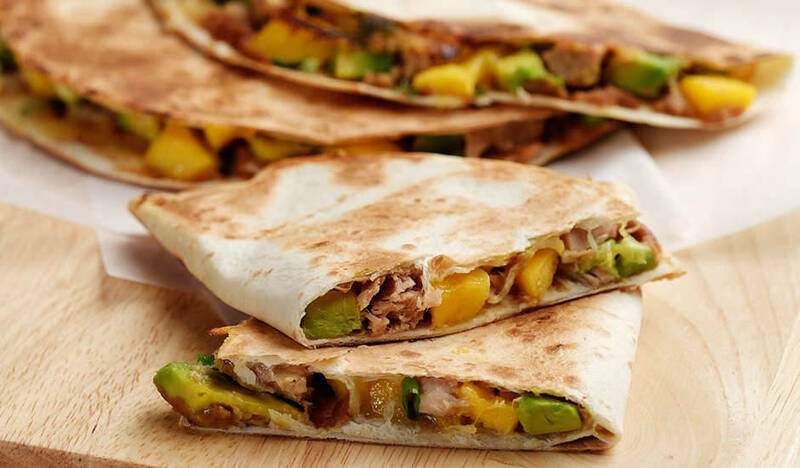 Combine the mango, avocado, onion and tuna. Spray tortillas with oil and place oil-side down on work surface. Spread one half of each with the beans. Top with the mango mixture and sprinkle with the cheese. Fold tortillas over to enclose the filling. Place 2 into the frying pan and weigh them down with something, such as a saucepan. Cook for 2 minutes on each side or until crisp and golden brown. Repeat with the remaining tortillas. If using a sandwich toaster, cook each for about 2 minutes. Note: Canned refried beans and burrito tortillas are available from the Mexican section of your supermarket.